My interest in the Altec Duplex speaker began when I first heard a mono cabinet driven by a Quad II. The owner was disinclined to part with it despite his fixation with Lowther drivers in home built Tractrix horns. The particular version I was able to acquire is the 604-168x a design that was intended for anything but home audio! 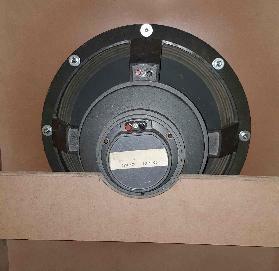 The Altec 604-168x loudspeaker has an 8 Ohm woofer, a 16 Ohm HF driver and came without crossover from the factory. See the Altec 604-168x specs. The biggest problem with this speaker is that it was intended for bi-amping, the main cone is 8 Ohm with a sensitivity of 97 dB at 1.2 m/Watt, the HF driver is 16 Ohm impedance with 105 dB at 1.2 m/Watt - note not the usual 1 meter measurement. 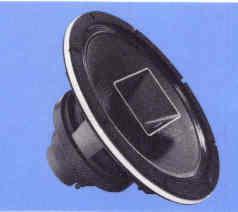 These drivers are more sensitive than earlier models and also have Ferrite Ceramic magnets instead of the AlNiCo used before. Plus the small multicells are gone in favor of the Manta ray horn. For a more complete rundown on the 604 variants, 604 Types, and thanks to the page owners! And the things weigh 15.5 kg! At the outset I chose to go with the Jean Hiraga design Onken type cabinet with some updates. Jean Hiraga, those of us who are French "challenged" apply Google Translation. I chose not to use plywood as it's expensive here in South Africa and Birch ply difficult to obtain. Supawood or MDF works well and if wanted comes with a range of veneers. In these cabinets all thicknesses were scaled up to 32mm and visible surfaces had a 4 mm Walnut ply on top of that. Edgings are of Kiaat. 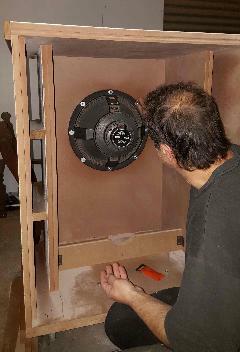 A skirt at the bottom was added behind which are 75 mm casters to facilitate moving the cabinets about as they are very heavy. The horizontal struts in the side ports are from solid Kiaat. The back is removable so as to fit the drivers and apart from 50 mm fiberglass damping on all interior surfaces there is a substantial strut which helps to support the magnets. By right clicking the images they can be opened full size in another browser tab. Seen at left the brace for the 604 magnet. Not easy to see here but the magnet protrudes backwards a fair bit and despite the eight 6 mm bolts holding the speaker more support was desirable. 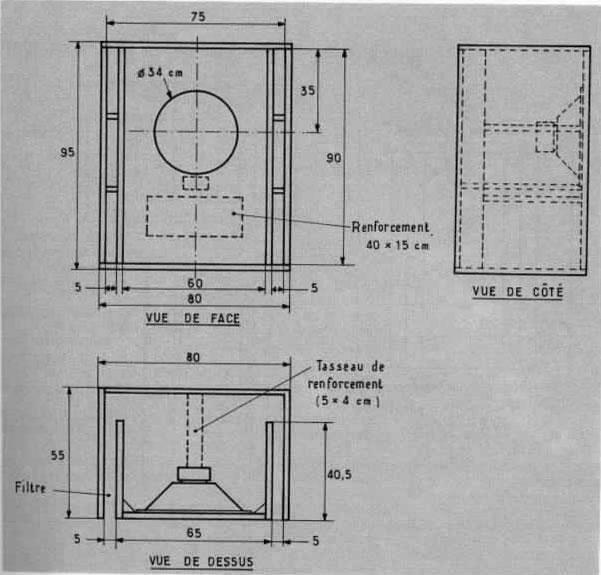 The wall thickness can also be seen and the dimensions from the drawing were adjusted to maintain the interior sizes. Some pictures during construction. All visible surfaces including those in the ports are clad in 4.. Walnut plywood. 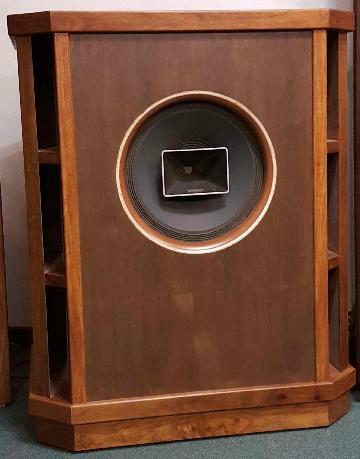 The white rim around the speaker hole is the underlying ply below the Walnut veneer. Rather than try to disguise this rim it was left as a feature. I chose to use what I had, a very high quality valve preamp built by the local valve Guru, Alan Hobkirk. And yes, the knobs are Gold plated. Then a Bryston 10B Electronic Crossover. The main cones are driven by a Carver TFM15CB amplifier capable of 100 Watts RMS into 8 Ohms. 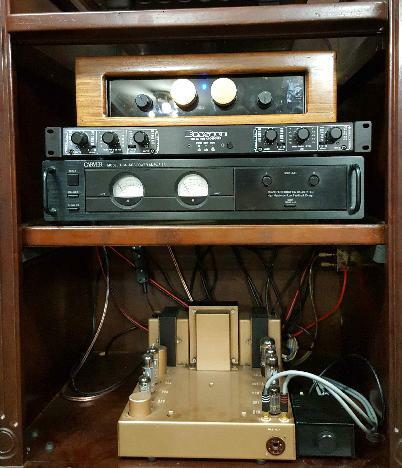 The HF unit is driven by a Leak Stereo 20 amplifier giving 10 Watts per channel. A nice touch here is that the Output Transformers have tappings for 16, 8 and 4 Ohm so the Altec 604-168x's 16 Ohm HF driver can be correctly driven. The small box on the right is an input attenuator as the Leak input is very sensitive and the Bryston, while it does have a degree of control on the signal, needs help to cut down the input to the amp. All cables are DIY using normal RF coax bar the flexible ones plugging into the Leak. The speaker cables are heavy rip cord. HF Horn: Cut in at 1 kHz/12 dB per Octave. Level is determined by the "black box"
While these may seem a bit unusual with a big overlap this is where the system sounds best and it's surprising how little output from the HF section is needed. It is always pleasing when, to quote "Col. John Hannibal Smith from the A Team", "I love it when a plan comes together!" 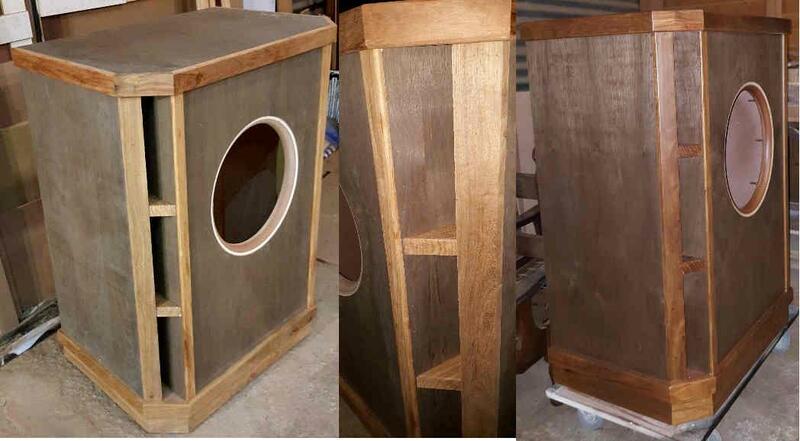 Putting together a really good speaker system is one of audio's pleasures and this one has elements from many well know sources. I am probably going to be lynched (Beginning of the Flame Wars) by saying at the outset that the Altec 604 series far surpasses the Tannoy offerings. Having had a number of Tannoys both 12" and 15" in different cabinets and versions I feel justified in drawing this conclusion. The Tannoys are smooth almost liquid sounding and are reasonably dynamic as I proved in my Double Autographs. The Altecs even in what is an upmarket reflex box are better. Dynamic, with ample reserves for playing stupidly loud, they never sound strained. The HF driver is very powerful and needs a fair bit of attention to keep it from being overwhelming, the Tannoy HF driver is only just good enough and sounds rough when it gets cranked up a bit. Liquid sounding the Altec's are not, nor are they laid back. Visceral but not crude, effortless dynamics combined with as much detail as you care to dial in via the crossover - very real sounding. The cabinets are placed next to my A7 Stack and against the wall, slightly toed in with the drivers directed at the listening position. From here they cover the entire frequency range from 32' Organ bass (16 Hz) to higher than I can hear with as much or as little volume as you want. Evenly. No big dips or peaks to mar your enjoyment, plenty of subterranean rumble when appropriate and very clean and clear. They are sensitive, very loud rock music might make the Carver meters peak at 10/15 Watts with no visible cone movement which means the main driver is coupling properly to the air. The usual audiophile wants of good imaging and speakers disappearing are catered for but more to the point the sound stage is as big as the room. The speakers are around 6 meters apart and image wider than that. With no problem they fill the room which is well in excess of 200 cubic meters. The ability of a speaker system to reproduce the feeling of being in the venue where the recording had taken place is one of the attributes I listen for and the Altec Onken does this. There are no good or bad recordings - they are what they are, bells, whistles and warts and all. These speakers do not tire you out and hours at a time of listening does not fatigue which is another good point.